Bardiani-CSF celebrates today its first win of 2017 season. Enrico Barbin has won sixth stage of Tour de Langkawi, 176 km from Senewang to Muar, taking also his first as professional rider. The winning action came in the last kilometer of the race when the bunch was preparing for the sprint. With perfect timing, Barbin exploited waiting moment before massive sprint, thanks also the support of teammates Paolo Simion and Marco Maronese, Barbin attacked with a powerful finisseur action, leaving no room for any come back. Giacoppo (UHC) and Pozzato (Wilier-Selle Italia) placed second and third, while Maronese and Simion completed the great day of #GreenTeam placing 5th and 8th. “This win is a huge satisfaction for me, not just because is the first in career but also for the way I achieved it” said Barbin. “We did a great job as team. We knew the finale was tricky and bunch sprint wasn’t really sure. Simion led me and Morenese in the best way. When the peloton caught last attackers, I decided to move pushing at my maximum. From the radio Zanatta explained the route, I knew what I had to do to win but I was not sure if someone already passed the line. It was a thrilling finale, I did not want to make a gaffe…”. “Last year, when I renewed the contract, I knew 2017 was a decisive season for my career. I’m not really young for cycling and the moment to understand what I can do in this world. Now I feel this win like a relief, but I really hope could be a new starting point”. With the time bonus earned stage winner, Barbin passed from 14th position to 11th in general classification at 59” from leader Gibbons (Dimension Data). Coming from Osio Sopra, Barbin will celebrate his 27th birthday in few day on March 4th. Professional since 2013, first year of Bardiani-CSF team, he always played supporting role for the leading riders of the #GreenTeam. Few results stand out in his palmares - 4th place at 2013 Roma Maxima, 7th in 2015 final classification of Tour of Turkey and 7th in 2015 and 2016 Memorial Pantani. In Under 23 category he took 10 wins among wich GP Liberazione, Piccola Sanremo and one stage Giro d’Italia baby. 2017 marks the third edition of the women's Strade Bianche and the opening of the second UCI Women's WorldTour. Taking place on Saturday, 4th March the race plays out a 127km route through the Tuscan hills. Eight gravel sections make up 30km of racing with various punchy climbs alongside a steep ascent to finish the race in Siena. After a gruelling 2016 edition, Leah Kirchmann finished in 10th place and Team Sunweb will be looking to take another solid result this year. 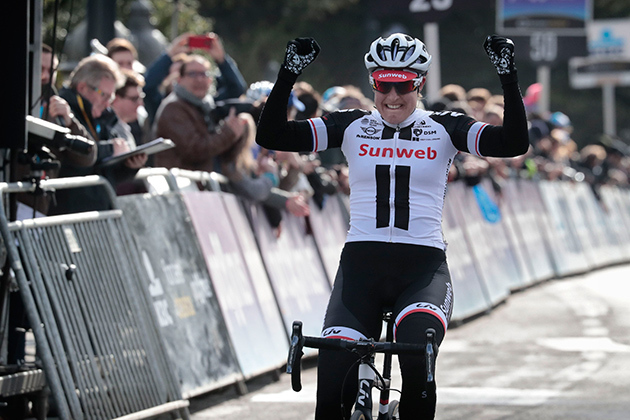 "This will be the second time that the team have competed in this great classic," said Team Sunweb coach Hans Timmermans (NED). "Strade Bianche is a really special race and as it opens the UCIWWT everybody wants to show something here. Last season Leah surprised us taking a top 10 and I expect that she is capable of performing well for the team once again. "Both Leah and Lucinda have proved that they can go far on a hilly course and they can trust their bike handling skills over the more technical sections. We aim to continue the great form shown by the team last weekend, but with a race like Strade Bianche you can never be sure how the race will play out." Saturday, 4th March sees the Porec Trophy take place in Croatia. Ranked at 1.2 in the UCI calendar the race features various professional teams on its roster, including the colours of Development Team Sunweb. The race is held within the Poreč, Tar-Vabrige and Kaštelir-Labinci regions and is part of Europe Tour. "After a long preparation period we are really looking forward to starting our season in Croatia," said Team Sunweb coach Sebastian Deckert (GER). "Having two one-day races gives us the chance to race in different team formations to determine where we are strong and where we still have potential to develop our strategy. We are looking forward to lining up at the Porec Trophy and creating some exciting racing." The 2017 edition of Paris-Nice takes place from 5 to 12 March. The race will take place over eight stages, starting outside Paris in Bois-d’Arcy, and finishing in Nice, France. The first three days of racing provides some opportunities for the sprinters. The opening stage features a 148.5km criterium through the outskirts of Paris just before the focus shifts towards the general classification battle. The course also sees an uphill time trial on Mont Brouilly and instead of its usual finish on the Promenade des Anglais, the race will this year finish on the Quai des Etats-Unis to mark respect for those that lost their lives in the terror attack of last July. "We are coming to Paris-Nice with a strong selection and with our riders well prepared," said Team Sunweb coach Morten Bennekou (DEN). "Michael will be making his 2017 race debut at Paris-Nice and with his successes in 2016 after winning two stages, the team will be working to take some more good results. "The second goal is to support Warren in his fight for the best possible GC result on home soil, but taking into account that it is still early on in the season. As well as these goals we of course base our participation on riding as a unit and perform well as a team." Julian Alaphilippe was a man on a mission in the fourth stage of the Abu Dhabi Tour, which had the peloton cover 26 laps on the 5.5km-long Yas Marina Formula 1 circuit. Pouring rain made things even more difficult for the riders, turning what should have been a quiet day into a hectic and nervous affair until the very end, when the stage concluded with the win of Caleb Ewan (Orica-Scott) over Mark Cavendish (Dimension-Data) and André Greipel (Lotto-Soudal). Lying 9th in the general classification and tied together with four other riders at 56 seconds behind red jersey wearer Rui Costa (UAE-Emirates), Julian was aware he had a chance to make a big jump in the overall standings, thanks to the bonus seconds put in play at the intermediate sprints. Under the floodlights, six men went clear and carved out a 1:10-advantage, but their gap started to shrink once Quick-Step Floors advanced to the front of the pack and made sure of reabsorbing the escapees before the last sprint. Jack Bauer was the one to lead-out Alaphilippe going into the last right-hand bend before the finishing straight and the 24-year-old Frenchman made the most out of his explosive acceleration to outkick two Bora-Hansgrohe riders and pick up three vital seconds. Julian didn't stop there and mixed it up with the fast men of the peloton also at the finish, coming home in seventh place. Quick-Step Floors' hard work at the front and Julian's determination were rewarded at the end of the day with the best young rider jersey and a solid fifth in the general classification, a remarkable result for a rider who's raced only eight days this season. "When you win a jersey is always very special and I'm glad to take it home. It means that we did a solid race as a team. Overall, Abu Dhabi was a success for our squad, having won a stage with Marcel, which was our primary goal, and finishing in the top 5 in the GC. I'm especially happy of my performance on the climb of Jebel Hafeet. 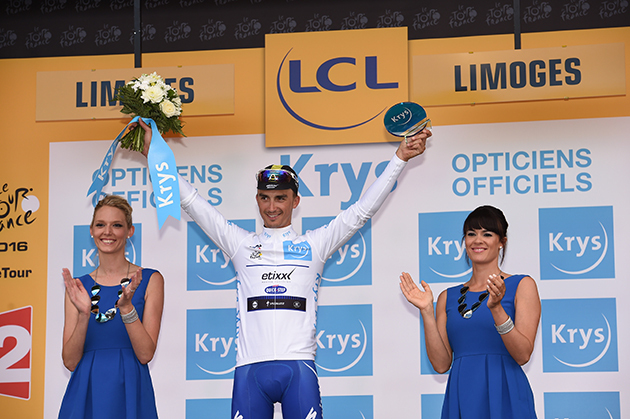 It was nice to be there in the front with the best climbers of the peloton", said Julian Alaphilippe. "I had good sensations and I'm going back home with a great morale and great memories of a nice race. I am satisfied with my result and my form, and now I'm looking forward to Paris-Nice. It's a completely different race compared to Abu Dhabi, but I will do my best to be ready and try to make the most out of this race." "The Abu Dhabi Tour was another good race for our team. Julian put in a strong ride on the queen-stage, while Marcel scored a great victory. The team coped really well regardless of the race circumstances and Julian's fifth place ahead of great climbers such as Contador, Quintana, Aru or Nibali, all Grand Tour winners, is promising for his next appointments", concluded sport director Rik van Slycke. VILLENEUVE D’ASCQ, France – For the second consecutive year Decathlon increased its turn-over by 12%. In 2016 the world’s biggest sports retailers generated a total of 10 billion euro in sales. Like-for-like sales growth stood at 4.4%, slightly less than the 5% Decathlon reported for 2015. Thanks to its flourishing sales in the past years, Decathlon doubled its turnover since 2009. And the France-based sports retailer is still expanding its global reach. Last year the company opened more than 164 new outlets worldwide, compared to 140 in 2015. It has established itself in five new countries: Mexico, Ivory Coast, Singapore, Malaysia and Slovenia. Decathlon is now present in 28 countries with 1,176 stores, of which 301 in France, 214 in China and 149 in Spain, which make up the top 3 countries for Decathlon. To continue its drive for growth and to reach out to new consumers groups Decathlon developed two new retail outlet concepts. Decathlon ‘City’ targets urban customers. The first outlet will be opened this year in downtown Paris. For medium sized towns Decathlon created the ‘Essential’ concept. These 1,000m² outlets will focus on families and mainly offer the company’s own brands.